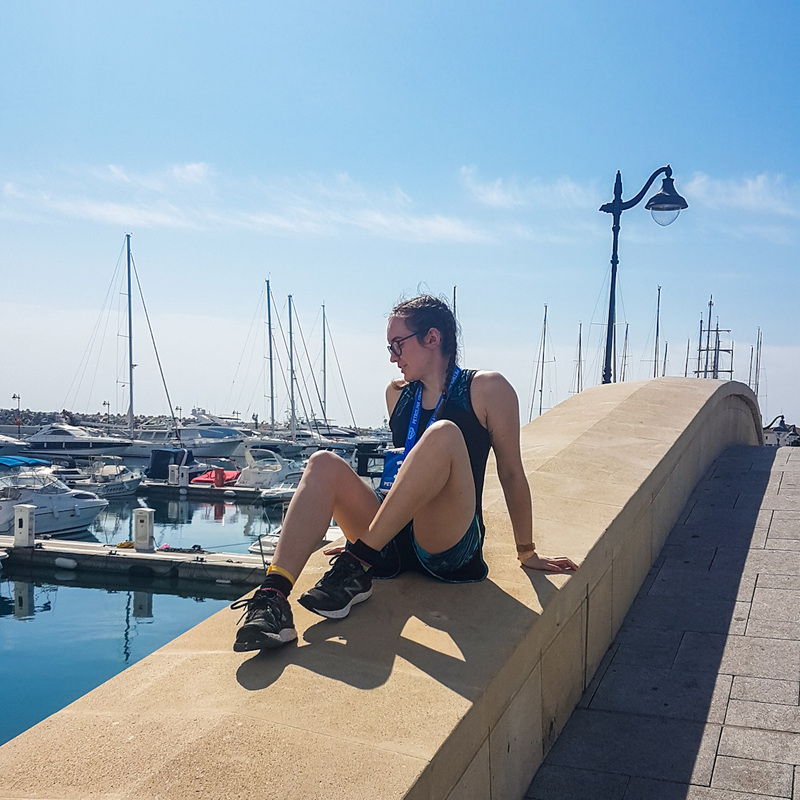 When family mention visiting Cyprus in March, and you know there’s a big race weekend that happens in the same area, you make sure it’s that same weekend. Right? 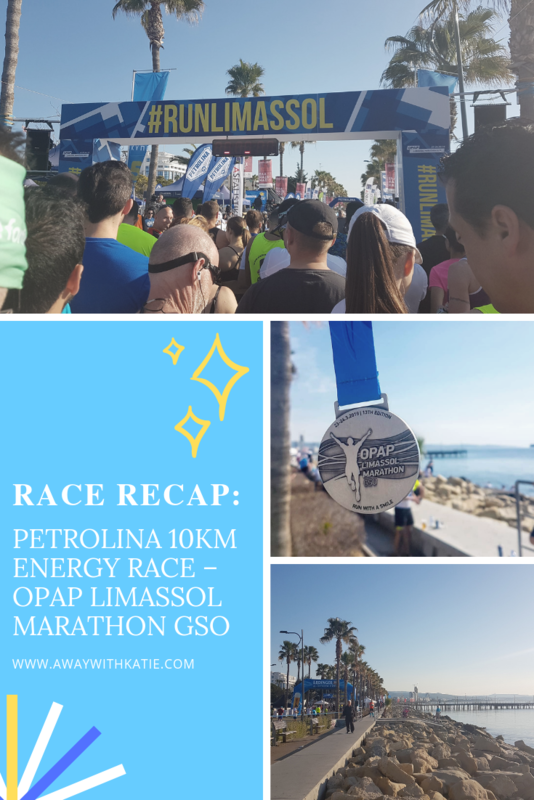 Planning a holiday around a race has become my favourite thing to do, so when I knew I’d be visiting Limassol, I just had to take part in the OPAP Limassol Marathon GSO weekend and with that the Petrolina 10km Energy Race . On the Sunday they had a marathon, half marathon, 10k and 5k. 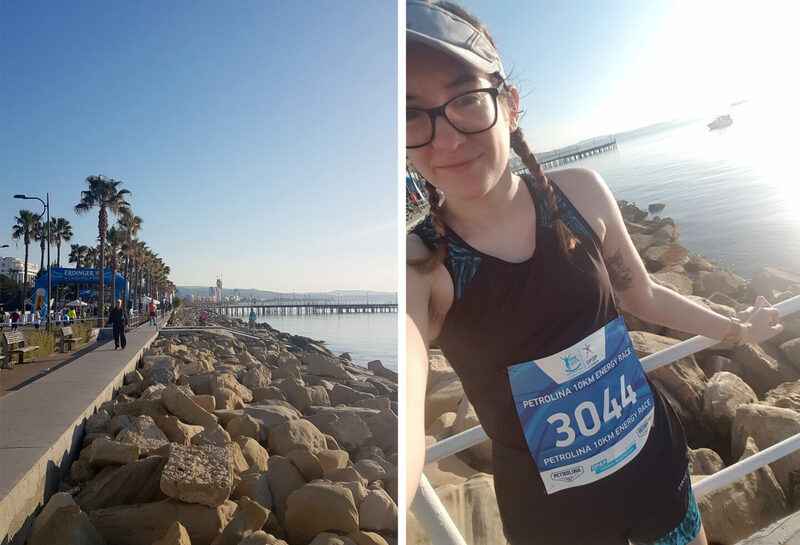 I chose to do the 10k mostly because I wasn’t sure how hot it would be, and I didn’t know whether I’d be up to a half marathon after the travel. 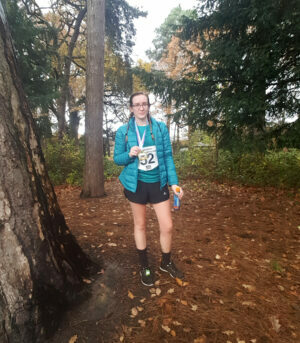 I was glad to have chosen the 10k because my sleeping in the lead up was not good! Overall, I thought the race weekend was very organised and had a great atmosphere throughout. 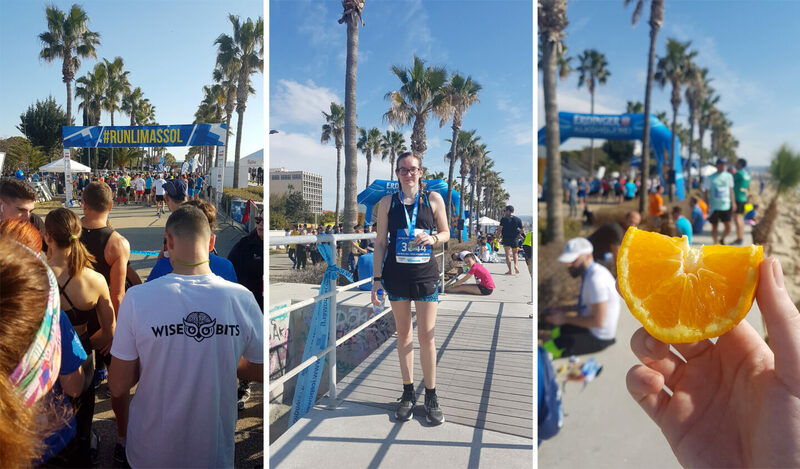 I do love a good race abroad – this was my second and won’t be the last! Your race pack has to be picked up before the race from a building near the race start, and this was open Thursday, Friday and Saturday. I went on the Saturday and it was very quiet when I first went in, granted it was around half 9 and the corporation 5km race had just started. 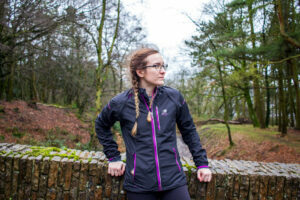 Each race had its own queue, and it was super quick from me stating my name and my pack being found. Great considering there were 4 different races. After grabbing my race pack, I headed towards the merchandise stand to pick up the t-shirt that I had bought when signing up, and I also picked up one of the hoodies. The sizing is just simply unisex, so I got small and whilst these are both still a little big on me, they’re not as bad as some that I’ve had and they’re also comfy. There was an information point so I asked about the buses, and the lady told me she’d recommend catching the earlier ones. I originally suggested 7 and she quickly said oh no, go for the 6am. I was surprised, but on the day I was glad to have listened. Make sure you pick up your free bus pass from this information point if using this service! An early wake up of 5:30am, quickly getting dressed and heading out to the bus stop. Luckily there was one right at the end of the street for me so I didn’t have far to walk. I got there for around 6:10 and the bus appeared around 10 minutes later. Once we got further done the coastal road it was pretty full and the driver had to stop picking up from a certain point because it was just too full. Not a big issue though – there were plenty of buses running to pick everyone up. The race area was buzzing with activity. The crowds were building up, with runners everywhere you looked. The baggage drops were easy to find, and very quick to do at that point. When you pick up your race pack you are given a string bag with everything in, and this has a clear pocket on the outside where you can slip in your little bag drop race number. Really useful! The pickup however was absolutely awful. There was no queue or system in place, just crowds of people pushing and shoving at the entrance to the baggage tents, screaming their number out in the hopes that one of the flustered workers heard them and found their bag. It was painstakingly slow but at the same time people were just extremely rude and it wasn’t the volunteers’ fault. This was very organised. The marathon and half runners were let through one entrance first, and after some time the 10k and 5k runners through another to join the back of them. We basically had four different waves setting off, and that was just each of the four races. So marathon runners to the front, then half marathon, then the 10k runners and then 5k runners. People on speaker phones were sending out regular reminders, telling people that they needed to be heading into the starting areas. It was quite relaxed really, everyone just hanging around and waiting. I think the marathon race did actually set off a little later than half 7 like planned, but it didn’t take long for everyone to get over the start line. We waited a little after the half marathon runners had left before we were off and away. I can’t be sure, but I think the 10k actually started earlier than 8am. 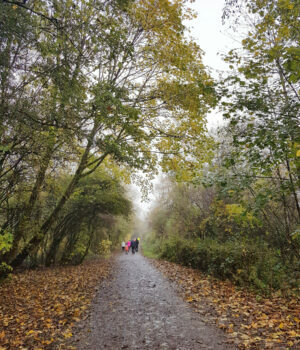 The route itself was very flat and straight, making it an easier one to run. There seemed to be a lot of photographers about at the beginning, and then a couple dotted about throughout the rest. Support on the course was alright. The start/finish line was busy as is pretty standard for any race. There was a guy on a bike with a huge speaker and he was cycling up and down the first couple of kilometres. That blast of music was a good push. We did have people lining the streets throughout the course but sometimes it was just a few people and sometimes more of a bigger group. The out and back route wasn’t the most scenic with a lot of it just being on regular roads, but you were still running along the coast and could see the sea on one side most of the way. I didn’t mind the route that much really because being in a new place it’s always interesting to look around. The first drinks station for the 10k was just before the 5km mark. And then we had another just after 5km. This one wasn’t necessary, but I assume it was really placed at that point for the longer racers who were rejoining us. Having come past it on the way out, I knew there was another station further down and this was at around the 7km point. Some of these stations included wet sponges and gels, which is always useful it hotter climates. There was also a shower station in between these – perfect to help your body cool down a little. The temperature had gotten to 20/21 degrees and whilst it felt warm, it wasn’t actually too bad to run in. I think I would have struggled a little if I were doing the half! Coming up to the finish line was good. There was a long straight stretch and all four races were finishing here so there was also a lot of support lining that last section. Once over the line it was a little hectic! I managed to spot a table almost immediately on the left with people giving out cups of an electrolyte drink – not sure what, but it was lemon flavoured. Nice to have at the finish though when you feel like you need something more than water. Just a little further there was a line of people handing out medals. Each race had the same medal but with a different coloured strap corresponding to the bib colour. 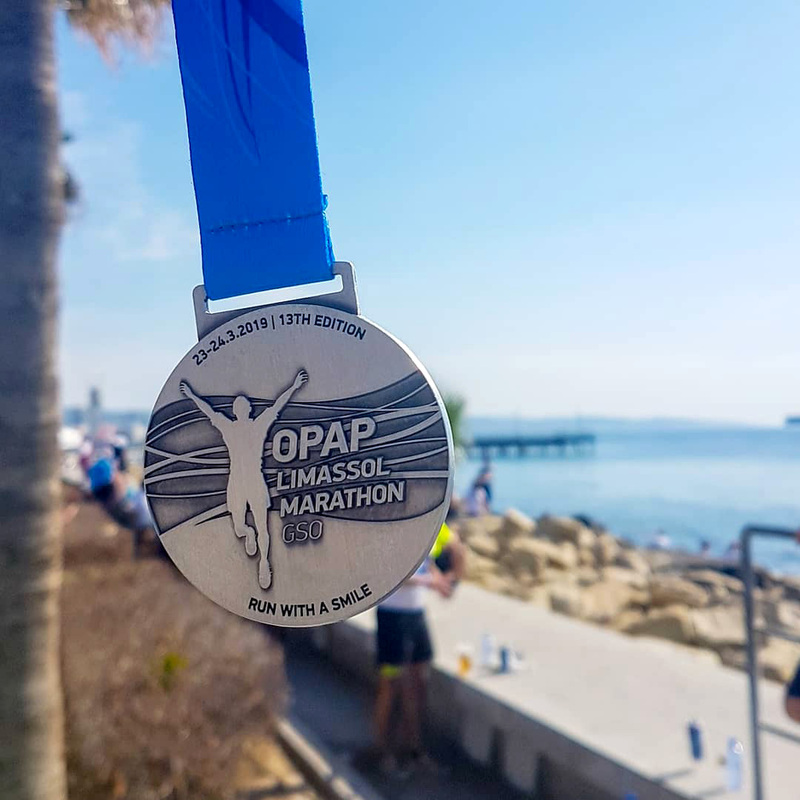 I have to admit I’ve never been a big fan of generic medals – it means I have one now that says Limassol Marathon (as the headliner of the race weekend) when I only did a 10k. But that’s a first world problem, I am aware. It’s not a big deal. I also spotted someone handing out fresh orange slices and this was a great end of race finish line treat. That little burst of sugar and flavour was a good boost! Just a little further along there were people handing out bottles of water. Then it was just all the finishers hanging around. A little crowded, but not overwhelmingly so. I hung about at the side a little enjoying the atmosphere before heading off to the Marina to meet my family. 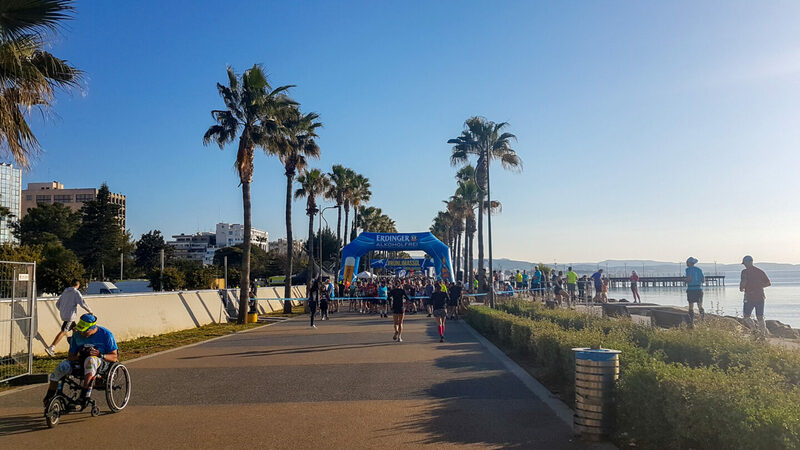 And that was that, the Limassol Petrolina 10km Energy Race done!